So far 2013 hasn't been a stellar year for Roger Federer. 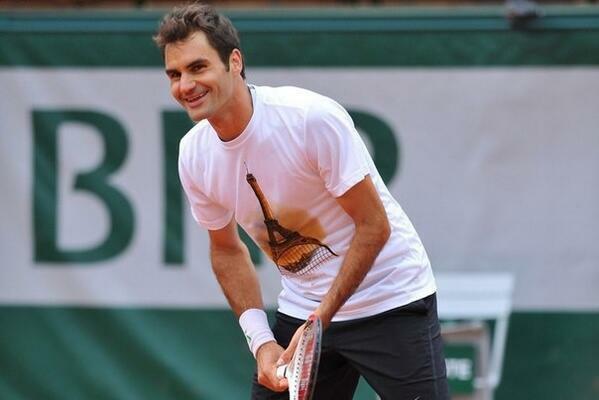 In fact, for the first time since 2000 he hasn't won a title prior to the French Open. Of course, as soon as he even loses early in a tournament the media begins to write about his decline and that retirement must be imminent, in spite of how many times he has come back after lulls in his results over the last five years. "I'm looking at the long term," he said, fully aware of the reactions he is provoking. "The short term is obviously important as far as confidence is concerned but I'm looking further ahead. People are talking, but if I win a major then all of a sudden, I'll be the best in the world again." "I'm concentrating on my level of play, I'm happy with what I'm achieving and I've got into a good rhythm in training. I'm where I wanted to be. It's good to get some confidence on clay, I'm playing well and I'm healthy. I tried a few things out against Rafa (in the Rome final) like all-out attack, even if I didn't manage to do it quite right. I'll think I'm ready for a semi or a final at a major." "I'm only just starting to play well, whereas the other guys might be getting mentally tired after months and months of competition. I'm not as tired as they are and that might be an advantage." It's so easy to start to doubt when the big results we are used to haven't been there. However, haven't people learned yet that this winner of 17 major titles with 35 straight quarterfinal appearances knows what he's doing? Sure, maybe everything doesn't go perfect, but Roger Federer has been doing this for a long time. He knew when he decided to take an extended break that it would probably affect his results for a while, but he's not a short-sighted type of guy. He wants to keep playing his much loved tennis for several years to come and in order to do that he had to give up some things in the short term in order to gain long term results. If he all of a sudden starts winning titles again like he did at the end of 2011 everyone will suddenly be back on the band wagon again. So I guess this is just a reminder and encouragement that we can trust this man who has proved himself again and again. While of course it can't last forever, I believe Mr. Federer has some great moments ahead with quite a few titles still to come, hopefully a couple of those being in grand slams!